Teaching Today, for Tomorrow was the topic of the 2018 Senate Plenary, which took place on March 27 in the William Pitt Union Assembly Room. 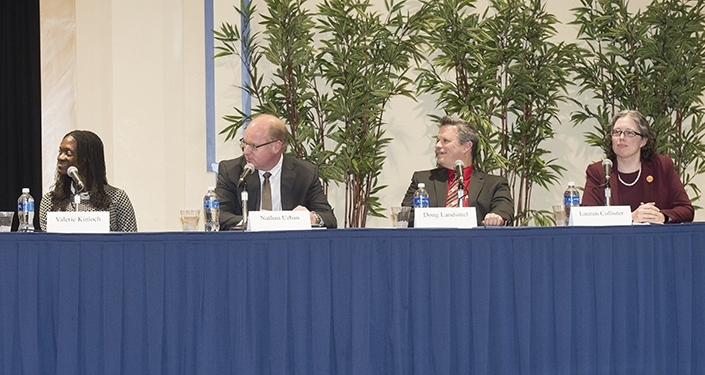 The annual conference focused on the changing environment of education and teaching and opportunities for the academic community to progress with it. Students, faculty and community members gathered for a symposium on the legacy of Thomas Parran Jr., U.S. surgeon general from 1938-1948 and the founding dean of the Graduate School of Public Health. The “Mean and Median Salaries of Full-Time Employees” report for fiscal year 2017 was presented at the University Senate budget policies committee’s March 16 meeting. The report, based on data from Oct. 31, 2016, covers all regular (not temporary) full-time employees except research associates and postdoctoral associates. At the March 21 meeting of the University Senate Council, President Frank Wilson noted the continuity that would come from any outcome of Senate officer elections, because all three candidates are active members of shared governance. Lawrence Feick has been named interim president of the University’s regional campuses in Bradford and Titusville, effective June 30, 2018, until a permanent president is appointed. James R. Martin II has been named dean of the Swanson School of Engineering. He will begin his deanship on Aug. 15. Bernard J. Costello, professor of oral and maxillofacial surgery, has been named dean of the School of Dental Medicine. He had been serving as interim dean since February 2018. Having served as dean of the School of Dental Medicine for the last 18 years as part of a distinguished 40-year career at the University, Thomas W. Braun retired, effective Jan. 31. To implement its commitment to provide a drug-free environment for its students, faculty and staff, the University of Pittsburgh prohibits the unlawful manufacture, distribution, dispensation, possession, or use of a controlled substance on University property or as part of any University activity.